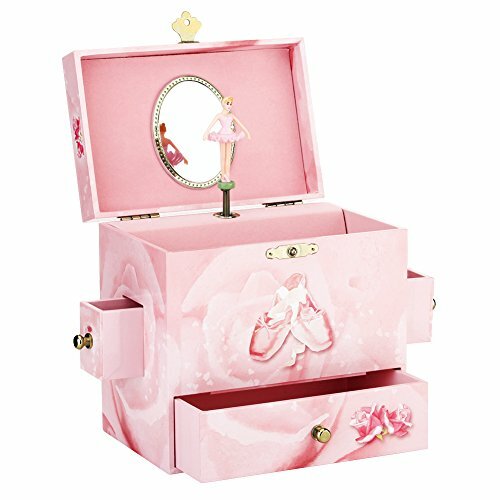 Whimsy and wonder adorn the Mele & Co. Pearl girl's musical ballerina jewelry box. 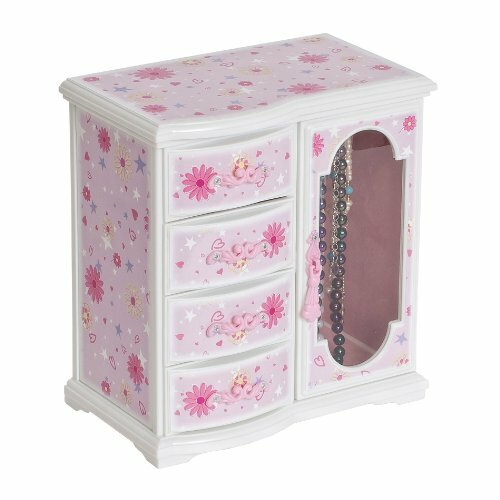 The delightfully decorated lid opens to an interior mirror and two compartments that your little one can fill to her heart's content. She'll be captivated as she watches the twirling ballerina and listens to the cheerful melody of "Fur Elise". The musical movement requires no batteries or electricity. Just a simple turn of the winding key on the back of the jewelry box will keep the figurine and music going for as long as your ballerina wishes. The necklace carousel compartment features a magnetic closure to keep the door securely latched. Three drawers allow for even more storage and let her arrange her items as she pleases. Drawers and necklace closet feature sturdy bright silver tone drawer pulls for a touch of sparkle. 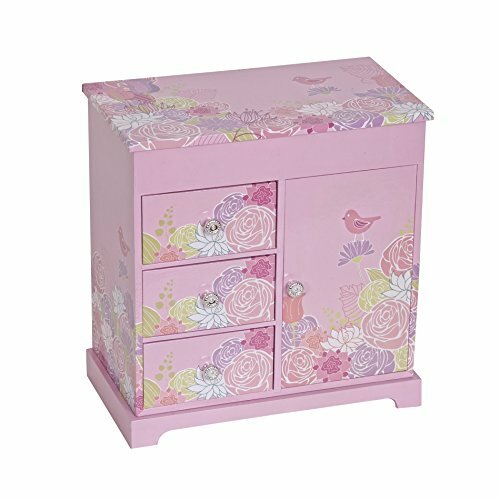 Pretty and practical, this ballerina music box promises plenty of storage and girlish giggles! Dimensions: 8 7/8" W x 4 7/8" D x 9 1/4" H.
1.Musical Jewelry Box 2.Beautiful fairy spins to the tune of "Swan lake." 3.Interior lined in purple fabric to safely store jewelry collection and features an oval shaped mirror. 4.Ideal for storing girl's jewelry including bracelets, necklaces, and other precious keepsakes. 5. Ballet themed musical treasure box features a lovely ballerina accepting a congratulatory bouquet, on a unique box style. 6.This beautiful music box will thrill any little girl. Comes with a dainty ballerina dancer who spins to the music of Swan Lake when the lid is opened. The 6" x 4" x 6" box is an ideal size for dresser or shelf..Warranty: • 12 months warranty and 45 days money-back.. • Safety of children is our TOP priority. All of our products are rigorously tested in development and production. • They meet and exceed all U.S. and European safety standards including lead and heavy metal content. • Please keep out of reach of small children. •Breakable parts could pose a hazard. For ages 3 and up. • Jewelry accessaries not included. What are you waiting for? 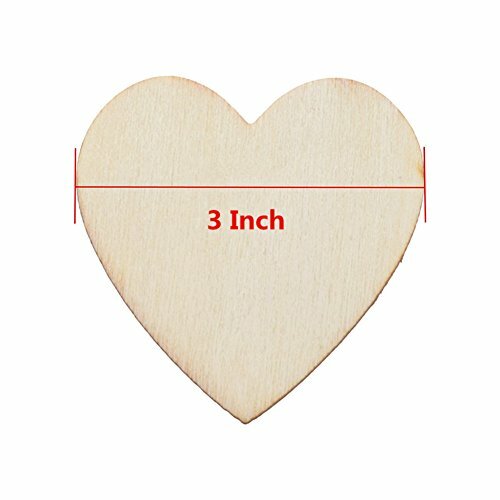 Add to shopping cart and give it to her at the highest discount now ! Super Value. 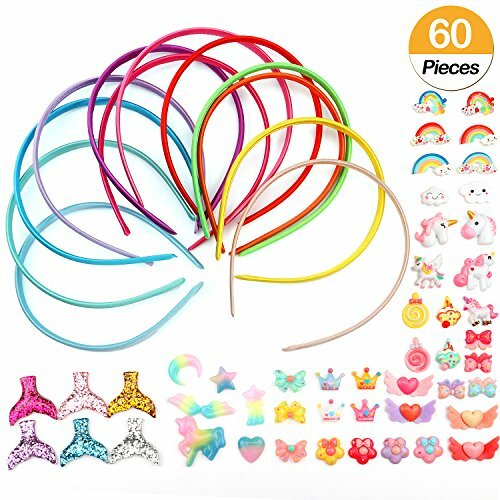 Girl's Pretend Play Headband Kids Arts and Crafts Hair Accessories Include 12 Satin Headbands, 8 Feathers, 4 Fabric Flowers, 2 Butterflies, 2 Hat Decorations, Crown and Heart, Assorted Ribbons, 15 Self-adhesive Velcro, Glue Pen, Craft Thread and 48 Assorted Rhinestones. Perfect For Making Her Own Headbands of Your Girl. 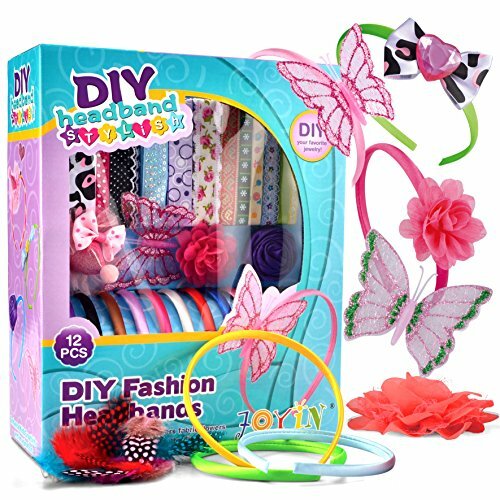 DIY Headbands Improve Creation and Imagination of Your Little Princess. 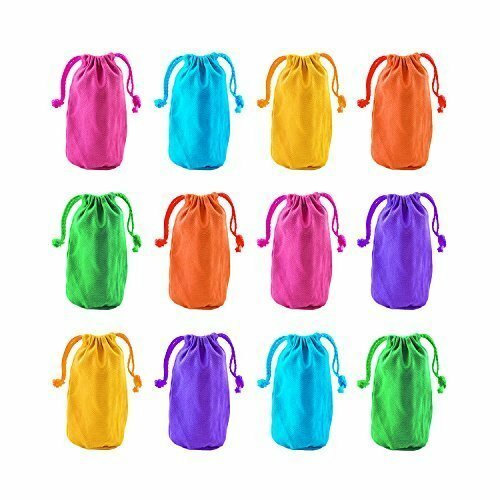 Ideal as Holiday Toy Gifts, School Classroom Prize, Christmas Gifts, Easter Stuffer, Easy Craft, and Girl's Night Create Hours of Fun Playtime. Structural Integrity. Superior Quality. Easy to Use. Super Durable. Vibrant Colors. CHILD SAFE: Non-Toxic. Meet US Toy Standard. ASTM Safety Test Approved. MONEY BACK GUARANTEE- "Contact Seller" and we will refund you or ship you a replacement if the one you received fail to work in 90 days. Fun and fabulous, the Mele & Co. Hyacinth girl's musical ballerina jewelry box is a splendid setting for her most prized possessions. The delightfully decorated lid opens to an interior mirror and a compartment that your little one can fill to her heart's content. She'll be captivated as she watches the twirling ballerina and listens to the sweet melody of "Swan Lake". The musical movement requires no batteries or electricity. Just a simple turn of the winding key on the back of the jewelry box will keep the figurine and music going for as long as your ballerina wishes. The necklace carousel compartment features a magnetic closure to keep the door securely latched. Three drawers allow for even more storage and let her arrange her items as she pleases. Drawers and necklace closet feature delicately scrolled drawer pulls for a graceful flourish. Pretty and practical, this ballerina music box makes a great gift for any occasion and promises plenty of storage for your own prima ballerina. Dimensions: 8 1/4" W x 5" D x 8 3/4" H.
Illustrated with a gorgeous princess in her magical world including adorable hearts and sparking crystal this beautiful musical box is sure to utterly delight. Selected materials and fine workmanship make it sturdy and durable so you can keep it for years to come. The beautiful pu exterior finish and the detail plush fabric interior finish make it anti scratch resistance and easy to clean. 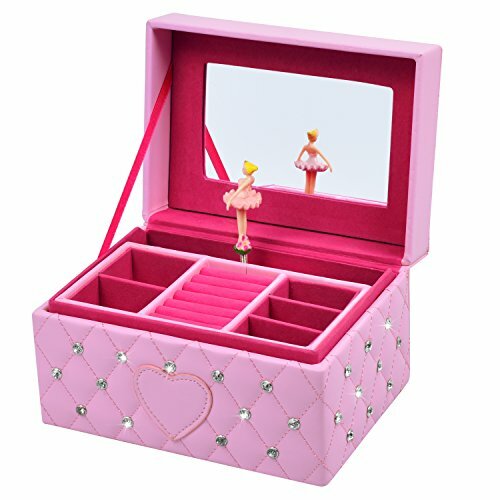 The top layer keeps your rings and earrings separate with compartments The bottom drawer with large space could accommodate necklaces,bracelets and hairpins well Smaller section are perfect for earrings,smaller necklaces,bracelets and rings The roomy compartments,hinged top,interior mirror and twirling ballerina are delight! Specification Brand name:Smonet Material:Hign quality PU leather + MDF Color:Pink Product Dimensions:7.1 * 4.9 * 4.3 inches Jewelry fans rejoice,you'll be ready to store all types of sparkle with this Smonet jewelry organizer! Looking for more Decorated Jewelry similar ideas? Try to explore these searches: Spdt Push Button Switch, Square Easel, and Mia Womens Eva.